All prices listed are FINAL,no hidden fees. The price listed on the website is the price you pay! We accept Paypal and Credit Card payments! We do not store any credit card, ATM debit card, paypal, or any payment information of customers at CardsCodes. Every transaction goes through paypal. Note that although we use paypal to accept payment, customers can pay us using any of the following means: credit card (MasterCard, Visa, American Express), ATM debit card, or paypal. 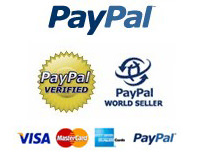 See more details at Paypal Safe Online Shopping.